3 rows of seating in a big luxurious box of an SUV with a jet engine under the hood – that’s the Mercedes-AMG GLS63 in a nutshell. Power is derived from a 5.5-liter bi-turbo V8, generating 577hp and 561 l-ft. A 7-speed automatic gearbox is the only transmission option, sending power to all 4 wheels. The AMG Night Package applies high gloss black finishes to the front apron, side mirrors, side window surrounds, rear valance, and tailpipes. Some safety features include autonomous emergency braking, blind spot assist, and lane keeping assist. Under Mercedes’ new naming strategy, anything beginning with a G is an SUV, while the last letter designates its place in the hierarchy of the Benz line-up. You wouldn’t be wrong then if you said the Mercedes-AMG GLS63 was the S63 of performance SUVs. In fact you’d be bang on the money. 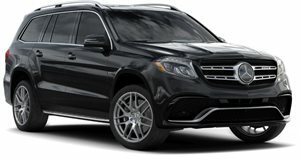 Formerly known as the GL63 AMG, back when AMG products still bore the Benz name, the basic recipe remains the same – a big V8 under the hood, all-wheel drive, and a three-row, 7 seat interior equipped with all the luxury trimmings you could desire. What’s in a name then? Well, not too much, really. Boxy exteriors generally aren’t good for much. But the one thing they are good for is lots and lots of interior room. 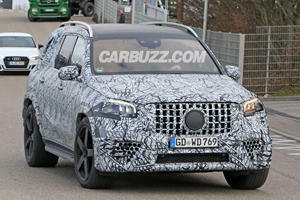 The GLS63 is very big, and very boxy – and seats 3 rows of occupants with the total seat count at 7. With all 3 rows in place, 16 cubic feet of cargo is still ample. Drop the 3rd row though, and that swells to 49.4, and with all rows behind the driver dropped, a rearward shout will echo into 93.8 cubes of space. Perched on any of the front 5 seats, the space is commodious and luxurious. Seats 6 and 7 are a little cramped in the leg department, but are still suitable for small adults. Everyone in the cabin gets to feel the luxury though – creamy soft leathers, h soft touch materials, and a range of available trim elements that exude class and luxury. The enemy of handling is weight – and in the case of the GLS63, there’s more than 5,700 pounds of it. 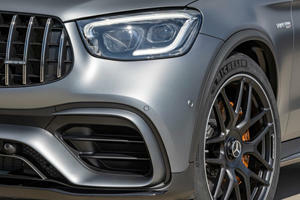 With broad 295/40 R21 profile Continental ContiSportContact 5 tires and a rear-biased AMG-tuned 4MATIC all-wheel drive system, the levels of grip the GLS63 produces border on the insane. But testing those grip levels requires either lots of bravery, or plenty stupidity, as you’d need to corner this land yacht at speed. On independent air suspension, the weight shifts itself around in a massive heave, the suspension dipping softly underneath it. Being so high up, it feels as if the GLS will roll. Switch the drive mode to Sport+ though and the suspension firms up as much as it can. It never reaches sports car, or even sports sedan levels of support, but it does a better job than you’d expect. It still maintains h levels of civility though, even on big wheels and stiffened suspension. It seems like just about every AMG these days features a 4.0-liter V8 under its hood. Not the GLS63, it comes from a generation ago when things were a little more old school, when there was no replacement for displacement. There is a V8, but it’s 5.5-liters in displacement and features two turbochargers to generate 577 horsepower and 561 lb-ft of torque. It gets channeled via a 7-speed automatic gearbox and hooks up grip via all four wheels to produce a 0-60mph sprint time of 4.5 seconds. That’s pretty rapid for something the size of a house. Being the S Class of SUVs, the GLS63 is extensively kitted, including parking pilot and a surround view camera, as well as an 8-inch touch screen featuring navigation and Apple CarPlay. Active LED headlights with automatic high beam are standard bits of safety enhancement, while other safety features include blind spot assist, lane keeping assist, forward collision warning, and auto-dimming rear-view mirrors for safer night time driving. The Mercedes-AMG GLS, or any GLS models for that matter, have not been crash tested by any local authorities. 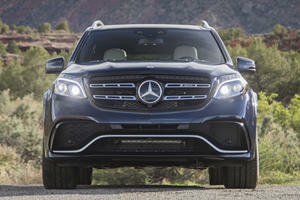 As big as a yacht and as luxurious as one too, the Mercedes-AMG GLS63 might have plenty performance, but it’s more about the unspoken authority it exudes than outright displays of dominance. Space for 7 and the ability to traverse most terrain make it the ultimate family wagon.